I´m trying to set up a local development environment for me to work on a Wordpress multisite that I´m building. I use Mamp Pro with default ports (Apache: 80, MySQL: 3306), and I also added a new host with the same domain name as the page will have when going live. So, now when I go to http://mylivedomain.com I get to my development page, and database entries seem to use the same url as it should when going live as well. Enabling multisite from here was no problem, but I´m struggling to get Wildcard subdomains to work. 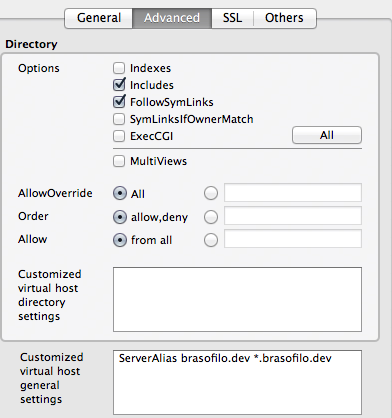 In the advanced tab under Host in Mamp Pro, I added: "ServerAlias *.mydomain.com", but that doesn't work for me. I´m able to add a new site from the Admin dashboard, but when trying to visit it I just get a 404. If you are using MAMP Pro you can simply just add another completely new host using your sub-domain and then just route it to the same place as your top domain. You won't have to add any virtual hosts in your original domain, or have to stuff around with your hosts file. Not the answer you're looking for? Browse other questions tagged multisite subdomains domain-mapping local-installation dns or ask your own question.